I get compliments on this fruit salad wherever I take it. It is super easy to make and a great dish to bring to a potluck or family party. It’s bursting with a ton of virbrant colors and flavors! It’s not only pretty to look at, but it tastes wonderful and is good for you too. A terrific blend of all your summer favorites – serve nice and chilled! 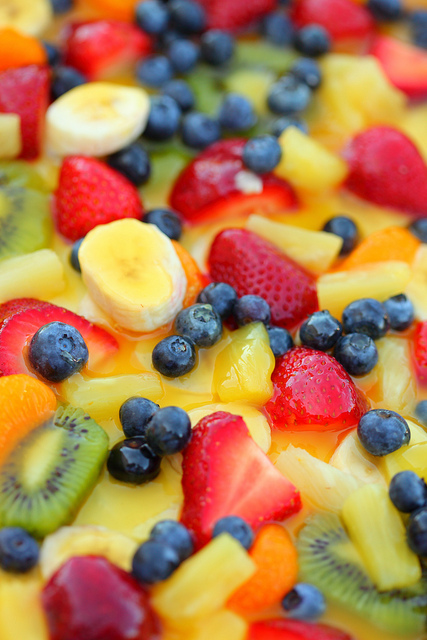 There are no set amounts to the ingredients just mix them to according to whatever fruit you like best.This recipe definitely doesn’t disappoint and really is a perfect summer fruit salad. Use any fruit you have. Substitute these ingredients however you see fit! Peel any fruit that requires it and chop up into bite size pieces. Mix everything together gently in a big bowl except the bananas and kiwi fruit. Add bananas and kiwi fruit just before serving.